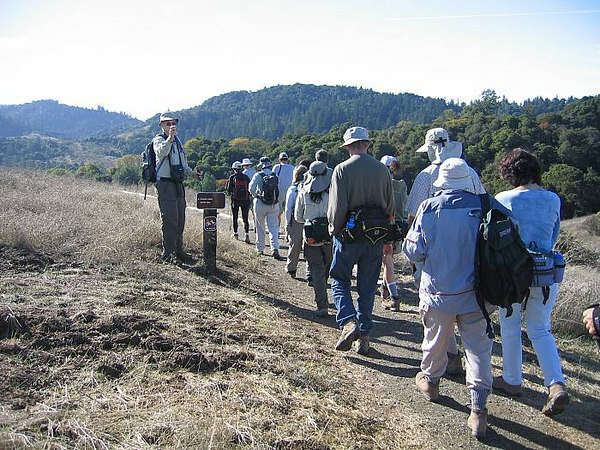 The Black Mountain Group (BMG) is a hiking group in the Loma Prieta Chapter of The Sierra Club. BMG is based broadly in the Palo Alto Area, although any Sierra Club member may be a part of this group upon request. We had a hike this date, led by past BMG chair and current hiking chair, Paul Worden, assisted by his wife Jacqui. We hiked in the Monte Bello Open Space Preserve, beginning at Monte Bello Ridge Parking Lot, then southward on the ridge to the peak of Black Mountain and thence to lower climbs, cirlcing back to the ridge--then a dive into a forested canyon with moss-laden oaks, firs and various deciduous trees, now in full fall color. We then ascended back to the parking lot fully refreshed. Along the way we rested for lunch while looking over the folds of hills to the south; and, we had a gathering of the arachnophiles among us, giving homage to a wandering tarantula. Paul Worden counts his flock, not wanting to lose any along the way.